Coloration Adult Male: Grey body with white wing patch. Males have a yellow face mask with bright orange cheek patches, the erectile crest is yellow and grey. Coloration Adult Female: The hen has horizontal yellow barring on the underside of the tail,(absent in males),and yellow spots on the underside of primary flight feathers. The smaller crest is light grey, cheek patch is dull orange. Coloration Juvenile: Immature birds appear visually as adult females and have a horn color beak. Clutch Size: 2-6 eggs A healthy hen will lay one egg every other day. Personality: Hand raised cockatiels are gentle, affectionate and extremely social birds; ideal family pets and great pets for kids. When integrating a baby bird into a new environment Keep in mind that parrots, as well as most other birds, are prey animals; quick sudden movements, loud noises, etc. will instinctively be perceived as threatening and should therefore be avoided. Make sure children understand that a successful, loving relationship is built on trust. Hand raised cockatiels are wonderful companions and an excellent choice for novice bird owners. Vocalization: Quiet - Moderate Good imitators, cockatiels will learn a few words and phrases and seem to lear nmore quickly from women and children, probably due to their higher-pitched voices. Males are outstanding whistlers; some will learn and repeat entire tunes. Females chirp, usually soliciting the attention of their owner. Diet: Parrots & Company Premium Cockatiel Blend, sugar free pellets of choice. Lots of spray millet, weaning mix (until their first molt) and cuttlebone. Cockatiels love bird bread/muffins, toast and crackers. Recommended fresh produce includes: broccoli (raw), carrots (raw or cooked), corn (raw or freeze dried), kale (raw), peas (raw or freeze dried), romaine, spinach (raw). Cockatiels are ground feeders, as a rule does not harvest fruit or nuts from the treetops; as a result these birds are not big fruit or nut eaters. Occasionally they may enjoy bits of apple, papaya, mango, shelled peanuts or walnuts. Please, NO pizza, chips, fries or other junk food. Housing: Minimum size cage 18”W x 18”D x 20”H. A small wood playpen is ideal for exercise and playtime out of the cage. This is a real asset if you have kids taking the bird from room to room. Cockatiels quickly learn to stay on their playpen and actually enjoy having a recognized area especially when in less than totally familiar surroundings. Enrichment: Bath spray, suitable natural wood perches, comfy perch, grooming perch, bungee or swing, small bird toys, foraging toys, small stoneware dish (for weaning mix & treats) and fresh spray millet. Please select safe, appropriate size toys for your bird. Rotate regularly and replace as needed. 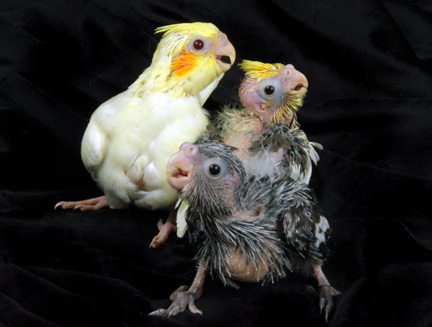 * Parrots & Company is breeding the following cockatiel mutations (color varieties).